Rabbit anti Mouse AGGF1 / VG5Q. A synthetic peptide selected within amino acids 300-400 of mouse Aggf1. 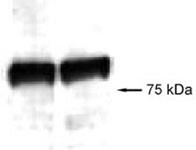 Rabbit polyclonal antibody raised against synthetic peptide of Aggf1. This antibody is specific for mouse VG5Q.